We will not sell, share, or rent your information to others in ways different from what is disclosed in this statement. AiStockCharts.com collects information from our users at locations on our website as described below. We record IP addresses, browser types, browser versions, pages visited and site addresses that referred you to our site - all in individual and aggregate form. We do not send cookies to your computer. Information you provide by submitting our contact form is exclusively used to respond to your comments or questions and is not sold, rented, or given out by AiStockCharts.com to anyone. We use IP address information in the aggregate and individually for administrative & security purposes. An example is to help diagnose problems with our server. Another example is to prevent visitors from violating our TOS (terms of service) agreement. We use browser types and version information in the aggregate and individually to help us design & improve our site. For example, if we noticed many visitors using certain brand browsers, we would be able to redesign parts of our site so that web pages are displayed properly for those browsers. We use pages visited in the aggregate and individually to determine what pages are the most popular among our visitors. This information helps us provide recommendations as to what pages our visitors may find valuable. We use site addresses that referred you to our site in aggregate and individually to learn what sites have linked to us. This helps us determine where the majority of our traffic is coming from (search engines, directories, guides, partners, reviews, etc...). We may share demographic information in the aggregate with our partners and advertisers. This information is not linked to any personal information that can identify any individual person. AiStockCharts.com contains links to other web sites on the Internet. Please be aware that we are not responsible for the privacy practices of such other sites. We encourage our users to be aware when they leave our site to read the privacy statements of each and every web site that collects personally identifiable information. This privacy statement applies solely to information collected by this web site. We allow third-party companies to collect certain anonymous information when you visit our website. These companies may use non-personally identifiable information during your visits to this and other websites in order to provide advertisements about goods and services likely to be of greater interest to you. These companies typically use a cookie or a third party web beacon to collect this information. AiStockCharts.com takes every precaution to protect our users’ information. When users submit sensitive information via the website, their information is protected both online and off-line. When users enter sensitive information (such as credit card number and/or social security number), that information is encrypted and is protected with the best encryption software in the industry - SSL. While on a secure page, the lock icon on the bottom of web browsers such as Netscape Navigator and Microsoft Internet Explorer becomes locked, as opposed to unlocked, or open, when you are just ‘surfing’. 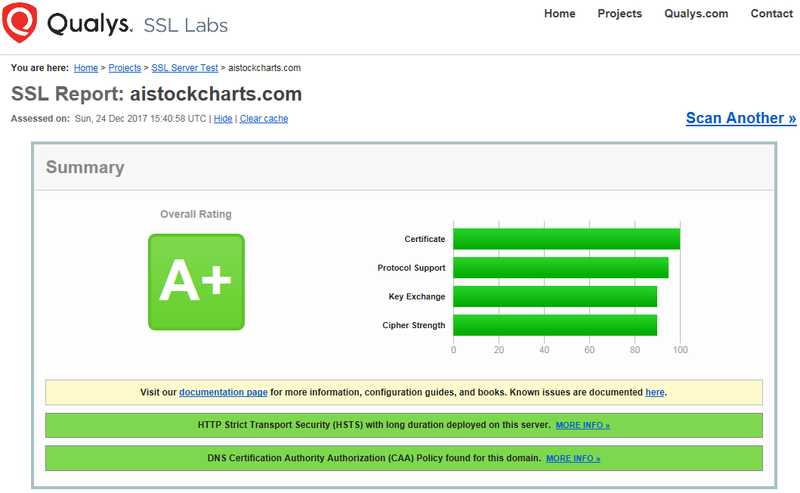 To learn more about SSL, click here. While we use SSL encryption to protect sensitive information online, we also do everything in our power to protect user-information off-line. All of our users’ information, not just the sensitive information mentioned above, is restricted in our office. Finally, the computers that we store personally identifiable information on are kept in a secure environment. If you have any questions about the security of your personal information at our website, please Contact using our contact form. If your personally identifiable information changes or if you no longer desire to use our service, we provide a way to correct, update or remove any of your personal data you provided to us. Please Contact using our contact form. Our service involves the sending of occasional emails from us to you for various reasons ( for example to provide the requested service, account maintenance, site news, etc.). If you do not wish to receive these emails you can immediately stop them by notifying us by using our contact form. You will receive a confirmation email once your request has been fulfilled. As per our sites terms of service, minors are not permitted access to our site without the express permission and supervision of their parent or legal guardian. We do not knowingly collect online contact information from minors under age 18 without prior verifiable parental consent or direct parental notification of the nature and intended use of this information, which shall include an opportunity for the parent to prevent use of the information and participation in the activity. Where prior verifiable parental consent is not obtained, online contact information shall only be used to directly respond to the child's request and shall not be used to re-contact the child for other purposes. We do not knowingly collect personally identifiable off-line contact information from minors under age 18 without prior verifiable parental consent. We do not knowingly distribute to third parties any personally identifiable information collected from a minor under age 18 without prior verifiable parental consent. We do not give the ability to minors under age 18 to publicly post or otherwise distribute personally identifiable contact information without prior verifiable parental consent, and will make best efforts to prohibit a child from posting any contact information. We do not entice minors under age 18 by the prospect of a special game, prize or other activity, to divulge more information than is needed to participate in such activity. When we state that we collect information in the aggregate, we mean for summary purposes only. For example, we collect referrer addresses "in the aggregate" to answer such questions as: "How many people from Google visited our site last week?" When you are connected to the Internet, your computer has a unique Internet ID called an IP Address. Some people that connect through a dial-up service, such as America Online, get a different IP Address each time they login. Others might have a permanently assigned IP Address, called a static IP Address. It is difficult or impossible for a web site to collect personal information about you (i.e., your name, email address, etc.) from your IP address alone. Browser types refers to the brand of browser that you are using to access pages on our site. Some examples of browsers include Mozilla Firefox, Microsoft Internet Explorer, Netscape Navigator & Web TV. By tracking what browser types are accessing are site, we can make sure that our pages are displayed properly to our visitors. Browser version is a number the browser developers assign to their software programs in order to keep track of different versions of their browsers. For example Microsoft Internet Explorer 6.0 or Netscape Navigator 4.7.